Madagascar, just off the coast of East Africa, is home to an amazing variety of wildlife, most exclusive to the island. A striking 250,000 species of animal reside there—70 percent of which are endemic—and a good number of them are endangered. While they may have been immortalized by the Disney film, the real wildlife in Madagascar is far more wondrous than anything computer animation can come up with. Flat-tailed geckos have to be seen to be believed, and that’s easier said than done. 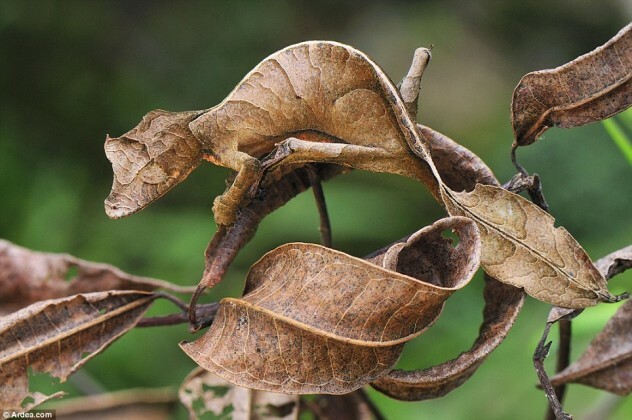 They’re masters of camouflage; each species has its own unique way of blending into its surroundings, some by mimicking decaying leaves and others by appearing as tree bark. Their coloration and light-reflecting body modifications render them nearly invisible to other creatures in the daytime. There are more than 10 species of flat-tailed gecko, all indigenous to Madagascar and its surrounding islands. The largest, also the second-largest gecko in the world, is the Uroplatus giganteus, which uses its ability to change color and the fringe of skin around its legs, body, and neck to camouflage itself among tree branches. 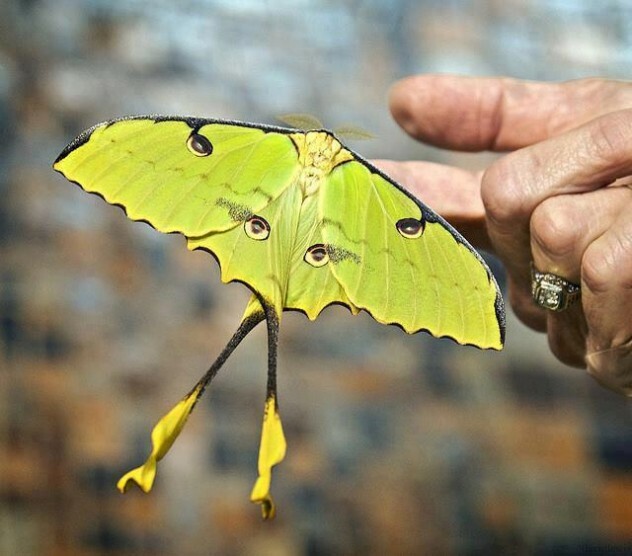 Comet moths, also known as Madagascan moon moths, are among the world’s largest silk moths. Their brightly colored wings can reach spans of 20 centimeters (eight inches), while their namesake tails can grow up to 15 centimeters (six inches). The good news for moth haters is that once these moths reach adulthood, they cannot feed and only live for four to five days. The bad news is that they’re capable of reproduction from the first day they emerge from their cocoons, and females can lay up to 170 eggs. The comet moth caterpillars feed on fresh eucalyptus leaves and have a pupation period of between two and six months; their cocoons have small holes in them to prevent drowning in the wet rain forests. 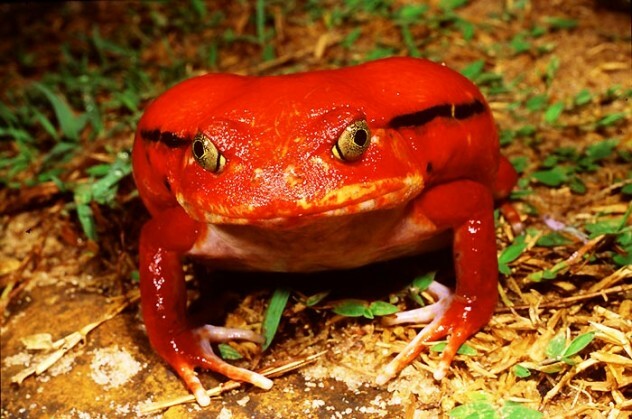 Tomato frogs are ambush predators, found only in the northern, wetter parts of Madagascar. They prey mostly on insects, but they’ve been known to eat anything they can fit in their mouths. While they’re frogs, smooth skin and all, they also have several toad-like traits: Their feet are not webbed, they have smooth toe pads, and when threatened, they can secrete an irritating, latex-like poison, as most toads can. Only the females have the distinct coloration that gives these frogs their name. The males are a dull brown. Their name suggests they should live on pirate ships, but aye-ayes are actually only found in Madagascar. These arboreal, nocturnal primates are well-adapted to life in the trees, their opposable big toes and tails longer than their bodies allowing them to hang from branches. 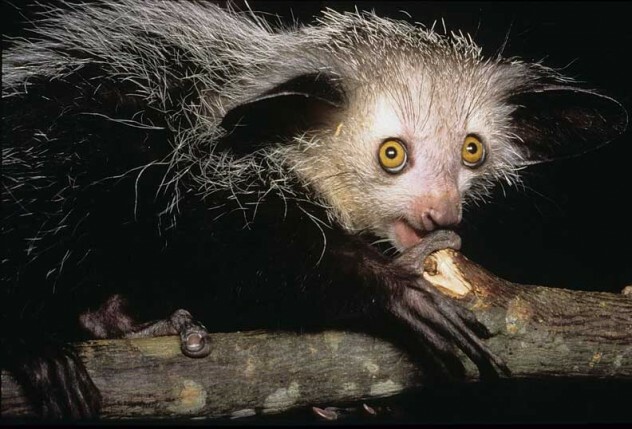 More remarkably, aye-ayes are the only primates that use echolocation to find their prey; they use their long middle fingers to tap on trees and listen for wood-boring insect larvae, using the same finger to dig them out of the tree when it finds them. Their large, sensitive ears and big eyes might be useful for finding food, but their bizarre appearance and behavior has caused the human inhabitants of Madagascar to consider them an omen of bad luck, and like many Madagascan animals, they are currently considered endangered. Aquatic tenrecs are among the most elusive species in the world. They’re only found at 10 sites in Madagascar, and since the biggest of these ratlike creatures are only 17 centimeters (6.7 in) long, they’re hard to spot. 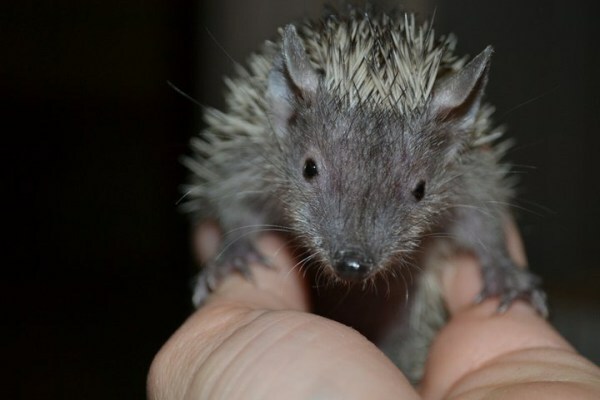 There are a number of tenrec species in Madagascar, but aquatic tenrecs are unique for their water adaptations: large hind-limb muscles and webbed feet perfect for swimming in the waters of Eastern Madagascar. They trawl shallow bodies of water for insects and tadpoles, rubbing the sensitive vibrissae (whiskers) on their snouts against the bottom. Once they locate their prey, they drag it to the surface, roll onto their backs, and subdue it with kicks from their hind feet. 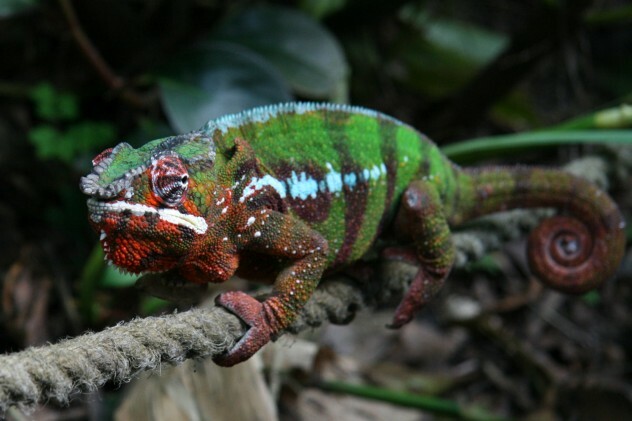 Like other chameleons, panther chameleons change color according to their mood, but these particular chameleons are usually vibrantly colored, especially the males when courting. It’s even possible to tell what location a panther chameleon comes from by their coloration; males from the northwest coast, for example, are known as “pink panthers” because they’re usually bright pink with a yellow-white stripe down their flank. But it’s not just the colors that make these creatures wonderful. They have the ability to rotate and focus their eyes independent of one another to simultaneously observe two objects. When they spot their prey, panther chameleons turn their heads to lock both eyes onto the target before striking with their long, sticky tongues. The tongue creates a suction effect when it hits the chameleon’s prey, which couples with the innate stickiness to prevent anything from escaping. 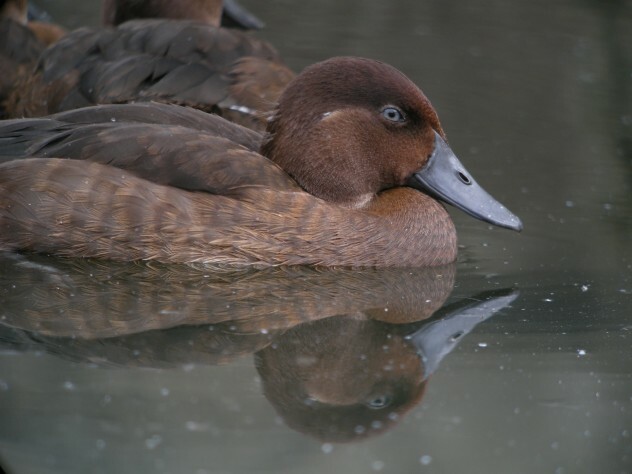 Madagascar pochards have the distinction of being the world’s rarest ducks. These medium-sized diving ducks feed on invertebrates, seeds, and aquatic plants and can stay underwater for up to two minutes. But this would have been written in the past tense up until 2006 because the species was thought to be extinct before a small population of 22 individuals was found on Lake Matsaborimena. Due to an extensive breeding program initiated in 2009, the population has increased fourfold, with ducklings bred in captivity and released into the wild. The pochards are still struggling though. Lake Matsaborimena is not an ideal habitat, and there are concerns that there is too little food for all of the ducklings to survive. Is it a dog? Is it a cat? 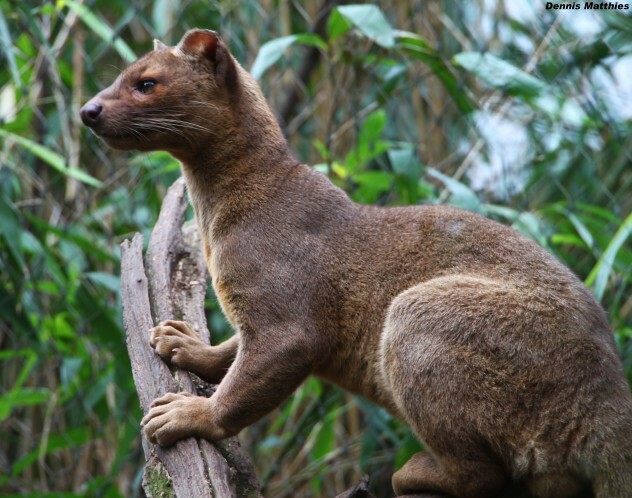 No, it’s a fossa, one of the few predators native to Madagascar. Until recently, fossas were believed to be felines, but they’re actually members of the mongoose family. It was an easy mistake to make, due to their strange appearance. They have doglike snouts and catlike bodies and are Madagascar’s largest mammalian predator, reaching up to two meters (6.5 ft) long from snout to the tip of the tail. Fossas are nocturnal, and over half of their diet consists of lemurs. They also eat reptiles, birds, other mammals, and livestock. They’re incredibly agile, with their long tails giving them excellent stability when moving from branch to branch, and their claws are retractable, meaning they stay sharp and aren’t worn down on the fossa’s travels. Unfortunately, fossas are becoming increasingly rare; not only do humans kill them for attacking livestock, but they’ve also destroyed 90 percent of the fossa’s habitat. The vast majority of Madagascar’s snakes are unique to the island, but few are so strange to the eye as Malagasy leaf-nosed snakes. These snakes, which like to hang from branches high in the trees, have bizarre nasal appendages protruding from their faces. 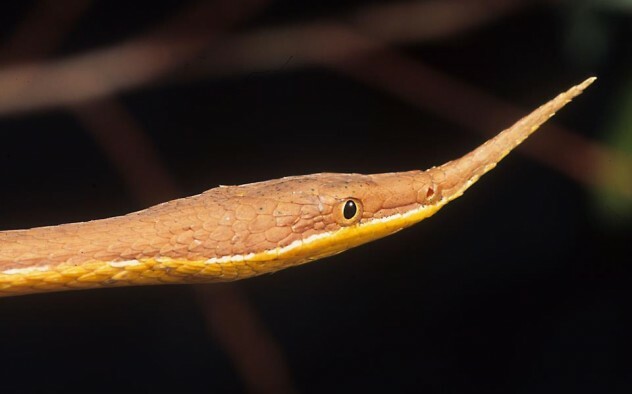 Leaf-nosed snakes are unusually sexually dimorphic for snakes; females can be clearly identified because their nasal protrusions are more elaborate and serrated, while the males have longer, pointier appendages. These protrusions are present from birth, so they aren’t thought to be used for sexual signaling. Instead, it is beieved they are used for camouflage purposes, since the snakes have a habit of ambushing predators. When the snakes lie still, their nasal appendages resemble leaves or the seed pods of some native Madagascan plants, meaning that the arboreal lizards they prey on don’t see them until it’s too late. Kevlar’s tough stuff, right? Well, compared to the Darwin’s bark spider’s web, it’s more like toilet paper. Only recently discovered, this spider’s silk is 10 times stronger than Kevlar and twice as tough as any previously discovered silk. 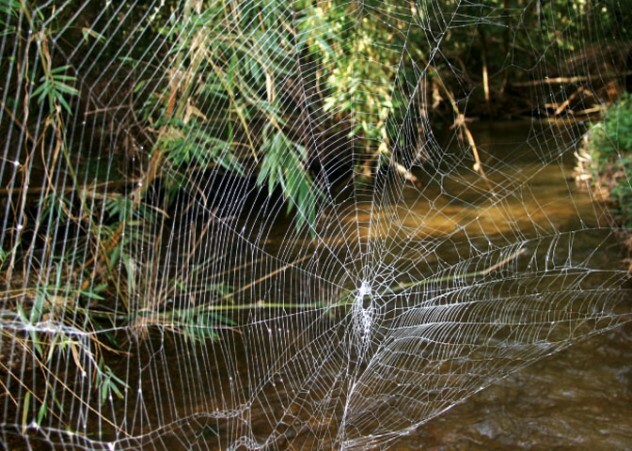 This means their webs can reach gigantic sizes; orb webs can cover three square meters (about 30 sq ft) and are often suspended over rivers or streams up to 25 meters (80 ft) across. Webs have been discovered with over 30 prey insects, mainly mayflies, trapped in them. The unique strength and size of the webs mean they can be placed where no other spider could live, reducing competition for food and space. Not bad for a species whose females have body lengths of about 2.5 centimeters (one inch) and males one-fourth of that size. Matthew is unemployed and writes to ease the pain. Find his other musings on his blog.